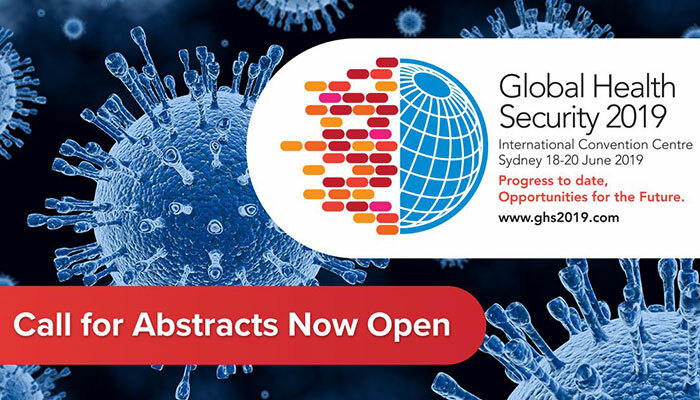 The Organising Committee for the Global Health Security Conference invites you to submit an abstract for presentation at the Conference, to be held at the International Convention Centre Sydney on 18 - 20 June 2019. Abstracts shall not exceed 200 words in length. The abstract is a short paper summarising your presentation (oral or poster). No acknowledgements, figures or references should be included. It will be published in the conference digital proceedings and given to all Conference attendees. Abstracts will be reviewed for content and selection purposes. In each of these areas, key areas will focus expertise into main avenues throughout the Conference. You must select one of the five key themes and then one sub theme that best describes your abstract. Final decisions on the type of presentation offered will rest with the Programming Committee and their decision is final. All abstracts must be submitted online by 9 November 2018. Please plan your timetable for preparation and submission carefully. Abstracts are to be submitted via typing abstract submission in the provided box. Abstracts must not exceed 200 words. Type or paste your abstract in the provided box noting that the word limit is 200 words, your abstract should include the headings below. Please note that scientific symbols, diagrams or tables are not to be included in submissions. Submissions that do not adhere to the requested format may be returned to the authors for re-submission. To be selected to present you are required to submit an abstract via the website. All abstracts must be submitted electronically. Prepare your abstract according to the submission guidelines and click the Submit Abstract button below. How will I know that I have successfully uploaded my abstract? Submitting an abstract involves two steps. Completion of the submission form and the submission of the abstract. Advice that your submission has been successful, will appear on your edit abstract screen as "submitted". You will also receive a confirmation email. It is a condition of acceptance of the abstract that at least the presenting author must register to attend the Conference and present the paper either orally or participate within the dedicated poster sessions. Abstracts submitted before payment of registration are eligible for an offer of acceptance but final acceptance requires registration and payment by the deadline of 1 March 2019. All presenting authors must attend at least the full day of their presentation. Submission of abstracts implies the author’s agreement to publish the abstract in all Conference publications including the website. Acceptance of abstracts does not imply any payment from the Conference Committee. Authors must arrange and pay their own accommodation, travel etc. to attend the Conference, unless they are supported by a Conference travel bursary. Some travel bursaries will be made available, based on country of origin and need. Acceptance or otherwise is at the discretion of the Conference Program Committee whose decision is final.